Yes, most people would not find this picture very exciting. However I am not most people. 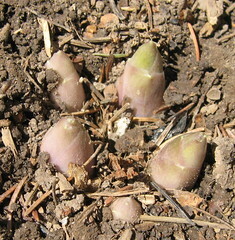 You know that spring is finally in the air when you see the first hosta noses start poking out of the ground. Well that day for me was today! I was so excited I had to grab my camera and take a picture of them. This is hosta 'Christmas Tree'. The first glimpse of hosta spears is definately exciting! My heart gave a happy leap yesterday when I discovered the spears of my Hadspen Blue hosta.